It depends on the period. Hangar deck should be #20 Deck Gray. The boarder would be the base of the roller doors, but I can't tell you how precisely it was followed. The bulkheads and overheads were white for the majority of the war, but there is strong evidence that they were silver through 1941 and some part of 1942. We have no documentation yet to give us a firm date or proof of this yet, but photographs for Yorktown, Enterprise, and Wasp at least strongly support it. Is this a photo of RANGER CV-4 in Measure 4? This photo appeared in Life Magazine on Sept 1, 1941. It's at the Norfolk Navy Yard, VA and shows RANGER, TEXAS and POTOMAC and two destroyers. Although there seems to be a different color below the main deck, this might not be the case due to the angle of the hull giving a different shade. The island is very dark compared with the TEXAS which would have been Measure 12 (?) or Standard Navy Grey. Also on the bow of RANGER, there is no separation of color between the Forecastle and Main Decks (at the bow). Finally, the mast appears to be painted light grey. Any reports of aftermarket Ranger photo etch for the Trumpeter model being in the works? According to Wikipedia, "Admiral Ernest King had planned to overhaul the carrier [in 1944] by lengthening the hull and installing new engines. 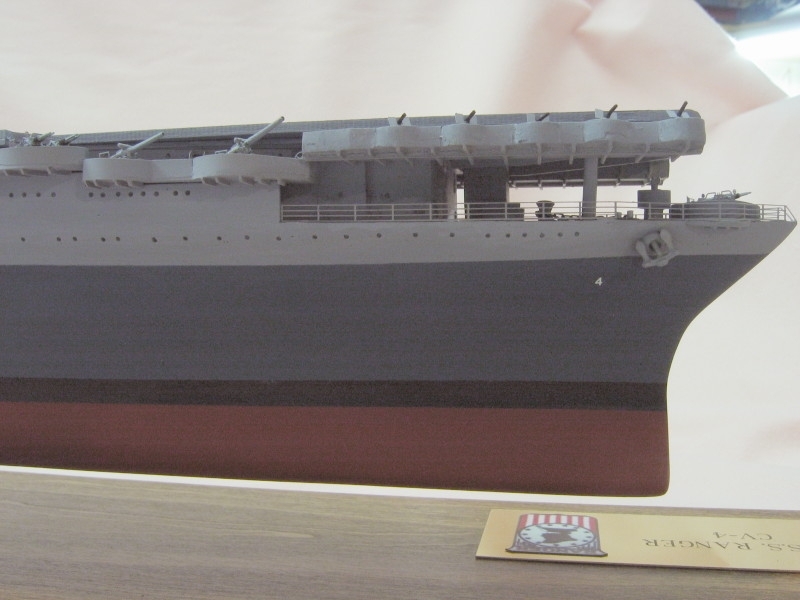 Ranger had been designed in the late 1920s, and consequently was smaller, slower and less armored, and carried fewer aircraft and ammunition supplies than the rest of the U.S. carrier fleet. 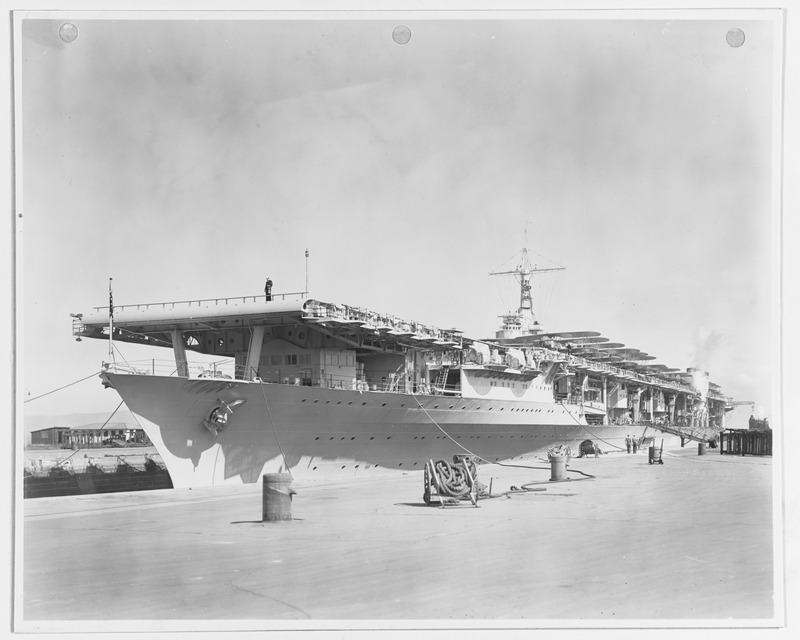 Admiral King favored having the conversions done, but his staff officers pointed out that allocating the resources required to accomplish this would delay the construction and repair of newer, larger, and more capable aircraft carriers. Based on this information, the full project was canceled." Are there any design drawings of what the finished project was supposed to look like? I think she would have looked the same but with a 40' to 50' plug in the middle to give her about same length as the Yorktown class. Would new engines result in changes to the six-funnel arrangement? it is the boilers that determine the number of stacks as Ranger had 6 stacks for 6 boilers. For the Ranger that is true. Designed as a true flat top carrier without an Island the boilers were placed aft of the two sets of turbines and each boiler had it's own uptake (funnel). Post subject: Early secondary conn on Ranger? ever researched this, or come across anything that might be helpful? at some point ('42? '43?) and the drawing now only reflects post-modification. There's a set of the Booklet of General Plans here on Maritime.org that show what appear to be three cable reels aft of the control station. They're not labled and I don't have any good shots of this area that clarify what they are. They could also be winches for pulling lines, but as there isn't a good "line" to a chock to pass lines through without rubbing against a bulkhead, I don't think this is likely. This set of plans is for 1944, but I don't think this area would have changed much. *Edit* I looked at the deck below on the plans and there's no motors or anything to support a winch, so I'm going to say these are not winches for sure. Tracy, those are the same plans that I had already linked before. Yeah, I started my post before you completed yours but was going through all of my photos and it took a while to finish. the superstructure forward from there, and changed the secondary conn to a bulletproof little box. What still missing is a clear shot of what's behind the conn... in some pics it looks like there's a passage back to the bulkhead behind it, and in some pics it looks like you can see daylight above it, like the passageway was not the full height of the bulkhead or conn.
An additional benefit of tracking down additional pics is that you see other things in the pics that could be modeled; an example would be that girder structure under the forward flight deck... very different from how it's portrayed in the kit. Also, that fact that the area behind the catwalk (looking under the deck) is open in most places, not solid, as kit manufacturers portray it. Gun tub on the rear of the island cut out, and location filled in with Evergreen; new walk made from same. Last edited by MartinJQuinn on Tue Jan 22, 2019 12:58 pm, edited 1 time in total.